Remember the flying cars in the TV series the Jetsons? Flying cars are not just for cartoons anymore! Google’s co-founder, Larry Page, has launched an autonomous flying taxi firm called Kitty Hawk. Could this mean competition for commuters and business travelers that use apps like Lyft? To reinvent personal aircraft transportation, Page invested in two flying start-ups, Zee.Aero and Kitty Hawk in 2010. The flying car projects were kept secret until a report by a bombshell investigation by Bloomberg Businessweek found that Page had invested $100 million into the project. Going back to 2014, Zee Aero and Kitty Hawk have filed dozens of different aircraft registrations with the FAA. These include electric gliders, rotorcraft, and fixed-wing designs that function more like traditional, commercial planes. What’s the Competition Look Like? At the 2018 Geneva Motor Show, the PAL-V Liberty Sport and the PAL-V Liberty Pioneer were introduced. These are made by the PAL-V Dutch company, claiming the world’s first production-ready flying cars. The PAL-V vehicles are gyroplanes, which, according to the company makes them “much safer and easier to fly” than helicopters or small fixed-wing planes. But you need more than a driver’s license to take this one for a spin. In fact, you’ll also need to get a pilot’s license. And when the Liberty is in flying mode, it must comply with FAA regulations. Which probably means that you can’t just take off if you are stuck in a traffic jam on the freeway. AirQuadOne was created by Neva Aerospace, a UK-based syndicate comprised of five European aviation and robotics companies. The future is flying high! Innovation & Disruption In Delivery: Could Your Next Amazon Delivery Be By a Drone? Ever Had a Package Delivered Late, Not at All Or To the Wrong Address? One of the most irritating issues with ordering online is whether the package gets delivered and to the right address and on time. I know I’ve experienced this a number of times and what’s interesting is that, as customer’s we don’t always think about the delivery service as the issue, but rather it reflects poorly on the company we by the product from. How to fix this customer experience issue? One option is to deliver packages to consumers’ homes using drones. Could this allow companies to bypass the challenges with that last step of the delivery? It might be for delivery to people’s homes. It might not work at apartments, though, because the drone can’t get into the apartment building. Or can it? What customers may not know is that the last leg of the delivery is the most expensive and inefficient part of parcel delivery. Customers don’t often think about that the product has to go from a store or warehouse, to the shipper’s delivery center and then from there, be deployed to the customer’s address. It is often not the place you bought the product from that is having the issue. It maybe who their delivery service or services are. It could be the individual who works for the delivery service. I know I personally had package delivered to an address that was similar to mine, but not mine. The individual was new to the delivery route and got mixed up. I had to run after the delivery truck, stop them and tell them they delivered to the wrong building. (I had gotten a text my package was delivered, but it was not on my doorstep or at the post office boxes for my building.) And since this happened more than once, I knew what had happened. What’s the Solution To Better Customer Experience Delivery? E-commerce companies, like Amazon, are using drones to speed up the this last part of the delivery process, while cutting costs. The result? Improving the customer experience, customer satisfaction and loyalty. And what’s interesting is even legacy retailers could take advantage of a similar process to grow online sales. So What’s the Hold Up? While there are many obstacles to overcome for instance, drone regulations, the development of autonomous flight and traffic control systems for drones, as well as consumer acceptance, there are companies actively trying to figure this all out. For instance, Amazon is working on drone delivery, depending on when and where they have the regulatory support needed to safely delivery packages. They want to use drones to deliver packages to customers around the world in 30 minutes or less. In fact, they have Prime Air development centers in the United States, the United Kingdom, Austria, France and Israel. They believe the airspace is safest when small drones are separated from most manned aircraft traffic, and where airspace access is determined by capabilities. To learn more, you can look at Amazon’s airspace proposals here: Best-Served Model for Small Unmanned Aircraft Systems and Revising the Airspace Model for the Safe Integration of Small Unmanned Aircraft Systems. As e-commerce providers like Amazon look for solutions within their own company, many logistics providers are experimenting with drone delivery. These firms also seek to cut costs as well as ward off competition, whether it’s from startups, technology companies or e-commerce companies. In fact, FedEx is betting on automation to Fend off contenders like Uber and Amazon. The shipping giant is investing in autonomous trucks and is interested in delivery robots, drones and an Alexa app. And while there are attempts to get this right, those of us in the innovation space know that #failfast – iterating and pivoting is the key. In my book, it’s ok to fail. You can’t learn what you don’t know, you don’t know unless you try. Trying means you learn something each time. Though the concept of failfast is very popular today, if we look back at Edison, it took him 9,999 times to get the filament for the lightbulb to work on the 10,000th time. What if he gave up? We’d all be in the dark! 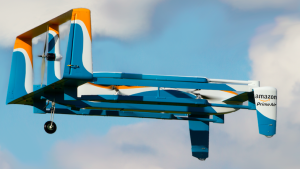 How Is Amazon’s Prime Air Trial Drone Deliver Program Progressing? Amazon have started with a private customer trial, to gather data to continue improve the safety and reliability of their systems and operations. As they gather data, this will bring them closer to realizing this how to use this innovation for all their customers. Does weather affect the delivery? Currently, Amazon is permitted to operate during daylight hours when there are low winds and good visibility. However, they are not using it when it rains, snows or in icy conditions. They feel they need to gather more data to improve the safety and reliability of their systems and operations to expand the offering. They are working with regulators and policymakers in various countries in order to make Prime Air a reality for customers around the world. Where Can you Find more Information On the Disruption and Innovation Drone Delivery Can Provide? In a new report, BI Intelligence examines the benefits drone delivery can provide as an e-commerce fulfillment method. In the report, they look at the different approaches companies are taking to experiment with the new technology and processes involved in this new delivery process. In addition, they look at the key players working in the drone delivery space. And have researched the challenges drone delivery faces in reaching mainstream adoption. Will Your Industry Be Disrupted? Every Industry Should Be Thinking It Will Be Disrupted! As I was giving a talk on disruption and innovation, I had many questions from what would be considered very standard legacy firms. What they need to be careful of is being aware of the fact that somewhere, in someone’s basement or garage, someone is probably working on a project that will disruption their industry. It’s customary to do the ostrich: stick you head in the sand. But doing so will only make you a dinosaur, (extinct) if you are not careful. Disruption and innovation are all around us. Just look at what happened to the taxi industry. Not only did Lyft and Uber transform how customers’ order, receive and pay for rides, but they disrupted an age old industry that had not changed for years. And take GM for instance. They make cars. But they decided to look at cars as a service and invest $500M in Lyft to be part of the cars-as-a-service industry. Instead of being one of those industries or companies that waits until an upstart disrupts their revenue model and takes marketshare, why not start innovating within your own company. Too many companies are complacent or don’t have the skills to think outside the box. If you don’t, it may want to seek out a firm that can you help you think through this new and confusing new frontier of design-thinking, innovation and disrupting yourself — as a company and as a person. No one wants to be the company that had the leg up on IBM and caused it’s own demise: i.e, nobody wants their story to go down like Digital Equipment Corporation: DEC.
“Digital Equipment Corporation achieved sales of over $14 billion, reached the Fortune 50, and was second only to IBM as a computer manufacturer. Though responsible for the invention of speech recognition, the minicomputer, and local area networking, DEC ultimately failed as a business and was sold to Compaq Corporation in 1998. The fascinating modern Greek tragedy in book form by Ed Schein, a high-level consultant to DEC for 40 years, shows how DEC’s unique corporate culture contributed both to its early successes and later to an organizational rigidity that caused its ultimate downfall.” Don’t do a DEC. The Digital Disruption Is Here. The digital disruption is showing up in a very traditional industry, the auto industry. How? General Motors, with the $500 million investment in Lyft, is creating a wider-ranging strategic partnership that will include a rental program for drivers of the car-sharing service and the creation of an on-demand autonomous car network. Lyft and GM began their talks about three months ago at the Los Angeles Auto Show according to John Zimmer, Lyft president and co-founder. The move is part of a larger effort to increase the company’s heft via a number of alliances, such as one with Didi, Ola Cabs and GrabTaxi, in what amounts to a global anti-Uber effort. Why GM And the Lyft Partnership? Lyft added GM to its arsenal because according to Zimmer, “GM is the largest automaker in the U.S. We both see the future of transportation through a network versus ownership, and this is a step in that direction.” What’s most interesting is to note that GM is looking to the shift away from its main business until now — the sale of cars — to a more service-oriented one. But now, Lyft has something Uber does not yet have — the significant backing of a major U.S. automaker. In May, Lyft did garner an investment from Bill Ford, executive chairman of the U.S. automaker, but it came from a personal venture fund. What About Self-Driving Cars? The partnership also marks Lyft’s boldest declaration yet that it intends to operate with self-driving cars in the future. Uber is already plowing significant resources into its own autonomous driving research, but it looks like Lyft will outsource this technology to GM. Google, the leader in autonomous driving tech, has also held talks with multiple carmakers about partnerships, including, reportedly, a big one with Ford. For GM, the investment puts it squarely at a major crossroads. The Detroit behemoth has already made a recent push toward ride-sharing and self-driving cars, but it has moved slower than German rivals Audi and Daimler. In October, GM said autonomous fleets of its electric Chevy Volts would be on the road in 2017. What Does This Mean for You? What that means is unclear as yet, with few details about when and where and how. More concretely and immediately, GM and Lyft said they will also offer “rental hubs,” allowing Lyft drivers to rent cars on a short-term basis. While neither Lyft nor GM would confirm whether the deal was exclusive, Amman noted that the partnership would require a “deep level of cooperation and integration.” Neither he nor Lyft president and co-founder John Zimmer would comment as to whether this was a prelude to an acquisition. On the other hand, what it does mean is that a business that has traditionally been in the business of selling cars is now transitioning into a service business. Which is a true indicator of the power service-oriented economy. How is your business shifting? Is it standing still, doing the same things it’s always done or is it looking into the future at a new version of itself? Perhaps it’s time for some new years resolutions?